The color for an item should be easy to distinguish from other items. Of course, it would also be nice if the colors looked decent, but from a functional perspective, the requirement is to be able to distinguish the items in the graph. I need to be able to generate an arbitrary number of colors and avoid a fixed color palette with a predefined number. For practical purposes the number will be limited by the ability to distinguish different colors, but it would be nice for the mechanism to scale gracefully as the number of items increases. The color of the background, for my purposes white, cannot be used. For more background the paper Color Spaces for Computer Graphics gives a good overview and discusses how the various color spaces were designed with respect to human perception of color. 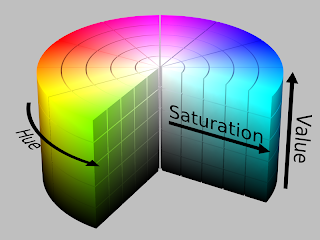 To generate a palette the saturation and value settings can be fixed. The 360o for the hue can be divided by the desired number of colors and then we just increment the angle for each color. This technique gives a nice palette, but for more than around 8 colors it will be difficult for a person to distinguish some shades. The Scala code I used for generating the palettes is shown below. // from the color white, i.e., (256, 256, 256). // Determine how much to increment for each color.